Native advertising is the world’s worst idea and I can’t believe the New York Times management is so gullible and clueless in agreeing to its publication. Gullible — because they were talked into giving away their hard won position as the nation’s top newspaper by marketing people looking for short-term gains. Clueless — because they can’t see the stupidity of their actions and how they’ve shot themselves in the foot, groin, and brains. The brands and marketing agencies are clueless, too. The practice is exceptionally harmful because it makes it seem as if all content is corrupt. Native advertising poisons the well of trust that publishers have worked so hard to build, and that advertisers benefit from. Ads are more effective in highly trusted publication. So why would brands and marketing agencies allow the erosion of readers’ trust in publications they need for their commercial messages? It makes no sense. 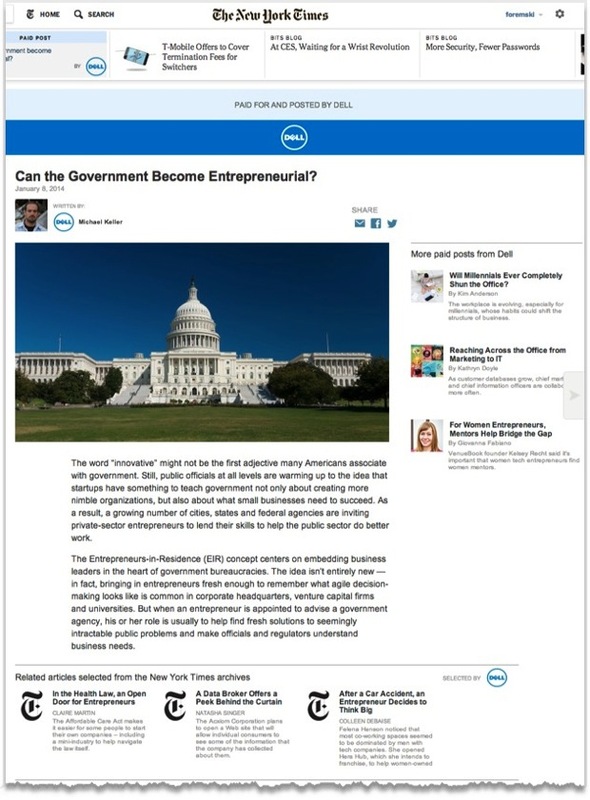 The New York Times’ first native ad page is seen in the screenshot above, and although it has a line of text, “Paid for and posted by Dell” it has New York Times branding all over the page. The next time New York Times reporters write about Dell its readers will think it’s paid for by Dell. This is very bad news for both parties. A good story on a public company, written by New York Times reporters, has tremendous value: in gaining new customers, pleasing shareholders, and raising the morale of staff. Labeling something “Paid for by Idiot Corp.” does not protect a publication from the loss of trust. A banner ad is a banner ad, we see it, we know it. Content that looks like trusted editorial content fools the mind of the reader. Which is the entire point of buying native advertising! It’s deception! Why would a newspaper want to publish deceptive content?! The New York Times has sold its future for a handful of beans. The trouble is that we don’t live in a magical world of beanstalks and golden eggs. A handful of beans satisfies the bean counters for a few financial quarters but it won’t cover the huge cost to the newspaper’s credibility and viability. Selling trust is foolish because it’s not a renewable commodity. Twice bitten, then thrice it’s gone. It’s the same way between people. The expanding use of native advertising will accelerate the demise of the media industry. Newspapers and marketers need to come to their senses and stop this practice now. Please return Thursday for my interview with Peyman Nilforoush, CEO of InPowered, and co-founder of the Netshelter advertising network. He feels as strongly as I do about the harm native advertising will have on trusted publishers. The New York Times management has a history of being clueless about trends affecting their revenues. I remember being shocked about ten years ago, looking at the home page of the New York Times, and all the ads were served by Google’s AdSense network. Underneath each Google ad was a line of text: “Click here to advertise on this site." The click went to Google. The New York Times had given away its customer relationship to Google — to another media company!!! What a foolish move. Ah, but Google is a tech company, thought the New York Times. Eric Schmidt brokered that AdSense deal but the deal hid a masquerade. Google was never a tech company. Oracle, Intel, and many others are tech companies. They sell tech. Google has always been a media company. It makes money from publishing. It uses Internet technologies to publish pages of content with advertising. That’s what a media company does. That’s not what a tech company does. The New York Times failed to see Google in its true colors until many years later. Today, its management continues to make bad business decisions. They are ruining a national treasure.